Every time we watch or read the news, there seems to be another crisis developing in the Muslim world. Whether it’s Africa, Asia or the Midlle-East, Muslims seem to be in turmoil. Some of us living in the West are moved by what we see and try to help in different ways, like organising and attending charity dinners. More often than not, a lot of awareness is created and generous donations are made. However, unlike war, earthquakes or famine, when a crisis does not make the headlines, our reaction is much more subdued. As time has gone on, more and more of us are beginning to realise that there is a silent crisis unfolding across Muslim communities in the West. Yet many of us are oblivious to how serious and grave the situation currently is and will continue to be in the future. This silent crisis is the erosion of the very fabric of our communities: the family. In my capacity as a family support consultant for a Muslim charity that works to strengthen the Muslim family, I see this crisis unfolding on a daily and weekly daily basis. Listening to what is going in people’s lives and seeing dysfunctionality in Muslim families is difficult, but we continue to work in this field because to help a Muslim in his or her hour of need is one of the noblest actions in our religion. The Prophet (peace and blessings be upon him) said “God is in the aid of his servant as long as his servant is aiding his brother” (Muslim). I often think that if people were able to see and hear only a handful of the cases I deal with, they would weep over our condition and work tirelessly to try and improve it. The reality is a complete contrast. It saddens me to see Muslims arguing over basic Islamic issues or spending their time and effort fighting and quarreling within organisations; whilst the community disintegrates around them. Divorce has now become common and is on the increase. Imams up and down the country are complaining at the number of cases they are having to deal with. As a community, getting the family unit right is critical, as a whole host of social problems result as a direct consequence of the breakdown of the family unit. For example, those who have experienced a broken family are 75% more likely to fail at school, 70% more likely to become drug addicts and 35% more likely to be unemployed. Furthermore, seventy percent of young offenders come from lone-parent families. With divorce on the increase, a disproportionate prison population (12% in the UK, more than 50% in France) and a rampant drugs problem among many young British Muslims; is it not time we took a serious look at what is really happening in the communities we live in? If we seriously want to tackle these issues, a lot more needs to be done than simply holding a few general talks on marriage and family life. We need to ponder deeply over some questions. Why are so many families falling apart? Why are scores of young couples divorce within a few years of marriage? And what do we need to be doing in order to rectify the situation? We need to re-think the way young people choose their partners and how marriages are conducted. Young Muslims need to be guided and educated on marital issues. As part of my work, over the last few years I have been running a course specifically designed for single Muslims; which aims to equip them with the tools they need before embarking on marriage. The course incorporates real life cases and examples of what to do and more importantly of what not to do. The realization that our families are in crisis is starting to hit home. Most of us have had some experience of family breakdown or know people who have gone through it. Single mothers are no longer a rarity. There was a time when non-Muslims admired the Muslim community for their strong family structures. Unfortunately, this has started to change. We need to act sooner rather than later. Inaction 10-20 years ago has led to our current predicament; the consequences of inaction today will only be seen in another 10-20 years time. PROFILE: Shaykh Amer has been described by the Sunday herald as one of the Scotland?s most prominent and respected Muslim thinkers. He holds a (LLB) law degree from Strathclyde university and BA (Hons) in Islamic studies from the University of Wales. He spent 10 years studying the Islamic sciences including 6 years with distinguished scholars in the Middle East (Syria and Yemen), gaining him teaching licenses (ijaza) in various Islamic sciences. His main field of interest is primarily Islamic family law; an area in which he has studied in depth having studied all four schools of Islamic jurisprudence. Currently, he is conducting a PhD research on the relationship between Islamic family law and Scots family law. He also has a certificate in counselling skills accredited by COSCA (Counselling & Psychotherapy in Scotland). He is an Islamic family law consultant to a local Scottish law firm and a Family support consultant at Unity Family Services. Part of his role at Unity involves delivering pre-marital and post-marital courses UK wide (www.unityfamily.co.uk/events.html). In 2007 he authored the booklet ?What Islam Really Says About Domestic Abuse? available at (www.unityfamily.co.uk/people.html). He is the author of the Reminder series - a series of short leaflets covering contemporary issues affecting the Muslim Community and wider society (www.the-reminder.co.uk). In 2009 he co-founded the Solas Foundation and with his partner Shaykh Ruzwan Muhammad, established the iSyllabus Islamic studies program. He is currently the co-director of the programme. He is also the Muslim Chaplin at Glasgow Caledonian University, where he delivers the Friday sermon and regular classes for students. 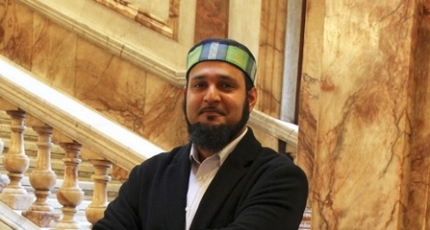 Shaykh Amer is consulted by Scottish Law firm for his specalist knoweldge in Islamic Family Law.